The 15 high-speed (150 to 800 strokes/min.) stamping presses at the ARaymond Tinnerman fastener-manufacturing facility in Brunswick, OH, produced 488 million pieces last year —800 part numbers stamped in lot sizes of 50,000 to 500,000. Those are big numbers, and any production hiccups can cause big problems. Until 2009, production hiccups are exactly what plagued plant manager Jim Stith and manufacturing manager Justin McCullah. 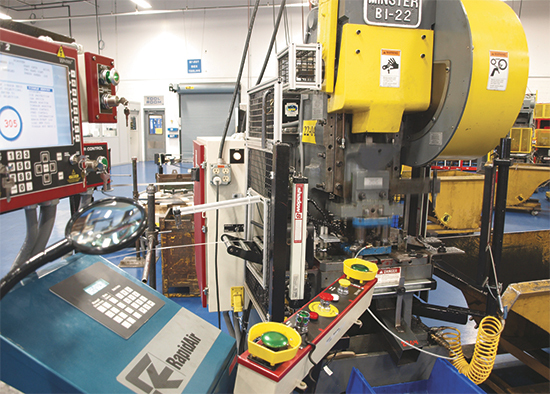 The 15 high-speed stamping presses at ARaymond Tinnerman produced 488 million fasteners last year—800 part numbers stamped in run sizes of 50,000 to 500,000. Almost immediately after the plant, formerly known as Tinnerman Palnut, came under the ARaymond umbrella, the top-down decision was made to bring order and clarity to its chaotic operations. The directive from ownership was to invest in technology as a long-term solution not only to cure current production woes, but to position the plant for future growth. Before this renaissance, there simply was no opportunity for growth, as the cramped facility already was running three shifts/day just to keep up. Now, as a result of an aggressive campaign to upgrade its press lines as well as quicken the pace through the plant, McCullah has been able to decommission seven presses since 2009, while maintaining throughput. The extra floor space has allowed the plant to expand its shipping and receiving department, while leaving plenty of room to accommodate future growth. Further, the plant now meets its production goals working just two daily shifts. Overtime has decreased by 90 percent and die-repair costs have been cut nearly in half. With its production environment so finely tuned, the plant’s focus is shifting to sales, where a recently fortified sales team is working to attract new customers in new markets. That’s welcome news to McCullah and Stith, who relish the opportunity to, finally, have new customers join its solid base of existing customers. To upgrade its press lines, ARaymond Tinnerman standardized on Wintriss SmartPac 2 press controls integrated with Wintriss clutch-brake controls, Rapid-Air servo feeds and Wintriss Shadow 8 light curtains. Shown is a Minster 22-ton high-speed gap-frame press with 2-in. stroke and 9-in. shut height. Since 2009 the ARaymond Tinnerman plant has overhauled seven of its 15 stamping presses; two presses will receive attention in 2013 and another three in 2014. Of the 15 presses, three are Bruderer high-speed models (rated to 800 strokes/min.) and 12 are 22- to 100-ton gap-frame Minsters rated to 500 strokes/min. Each overhaul project includes replacing aging and outdated press controls with new Wintriss SmartPac 2 press-automation controls integrated with Wintriss Shadow 8 light curtains, clutch/brake controls, and greatly enhanced die-protection and tonnage-monitoring capabilities. Also included with each setup is Wintriss’ DiPro Sensor Interface, which enables the shop to connect electromechanical and discrete-output electronic sensors to the control. Front-panel connectors allow wiring individual sensors, while larger connectors allow use with die-mounted junction boxes for connection of as many as eight sensors to the DSI with a single cable. The plant’s approach to integrating sensors mirrors its press-overhaul approach—everything is standardized to simplify plant-floor decisions and help avoid errors. 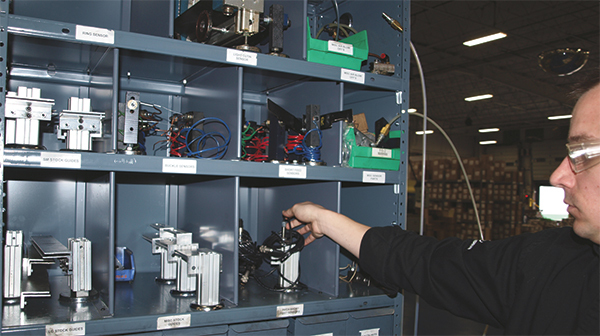 In the middle of the pressroom sits an 8-ft.-tall shelving unit that serves as the plant’s “sensor toolbox.” On it, press technicians can find stock-feed sensors, ring sensors, proximity sensors and laser sensors. ARaymond manufacturing manager Justin McCullah shows off the company’s new “die-protection toolbox” that houses an array of proximity, ring and laser sensors. Each sensor is prescribed for certain duties on the plant’s high-speed presses, to protect its aging set of dies that lack the room to house sensors onboard. With more reliable equipment and controls on board and with sensors now protecting its dies, Stith and McCullah have raised the bar on throughput. And they note that the bar has not stopped rising. • Overtime Hours Worked—Decreased from 5600 hr./yr. to 500 hr./yr. • Average Run Rates—Increased from 11,000 parts/hr. through the shop to 15,000 parts/hr. How successful is the plant at realizing the lofty goals set by McCullah and Stith? “We set management business objectives (MBOs) for every employee, hold them accountable and reward them for success,” says McCullah. “In 2011 we asked our employees to reach the efficiency-improvement goals we established on 80 percent of our work orders. We upped that to 85 percent last year and 90 percent this year.” Employees were rewarded for their efforts with a performance bonus in 2012. Of course when it comes to press run rates, just cranking up press speed does not easily nor automatically translate into increased throughput. Most notably, the accompanying adjustments made to the coil-feed line represent a critical success factor. And here’s where another unique capability of the Wintriss SmartPac 2 comes into play—it’s called Feed Advisor. With SmartPAC 2’s Servo Feed Interface (SFI) option, available for most brands of servo feeds (including the Rapid-Air feeds that ARaymond has added to its upgraded press lines), users can program, store and automatically download feed parameters for each tool. With a programmed feed length, feed arc and press speed, the SmartPac determines whether or not the feeder can operate in the time available. It then calculates the minimum feeder acceleration rate required. 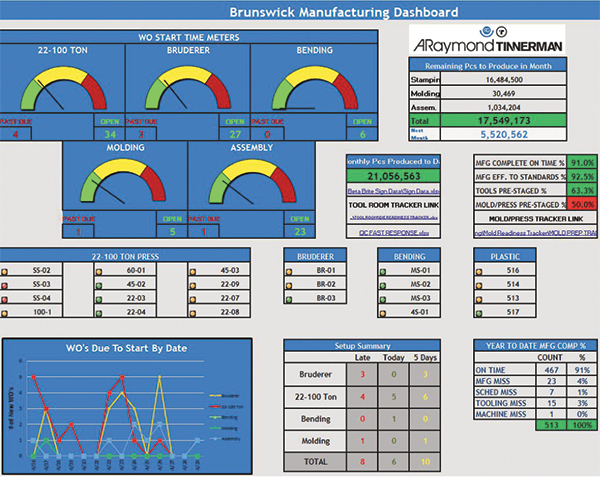 This manufacturing dashboard provides ARaymond production managers with a snapshot look at a healthy dose of production statistics. Of note (bottom right corner): year to date, 91 percent of its 467 work orders had been completed on time, with only one miss due to machine-related issues and 15 misses due to tooling-related issues. Before the plant began to upgrade its presses, at least one job per week would fail to start on time, launching the scramble to get up to speed to meet delivery times. That’s no longer the case. “Through all of last year, only two work orders failed to start on time due to unplanned machine downtime,” says McCullah. As the shop has become leaner and meaner, with no excuses accepted for not starting and completing production runs on time, plenty of attention has steered toward reducing changeover times. And as lot sizes have dropped in the last few years, the frequency of setups performed has doubled; setups can average 3-4 hr. 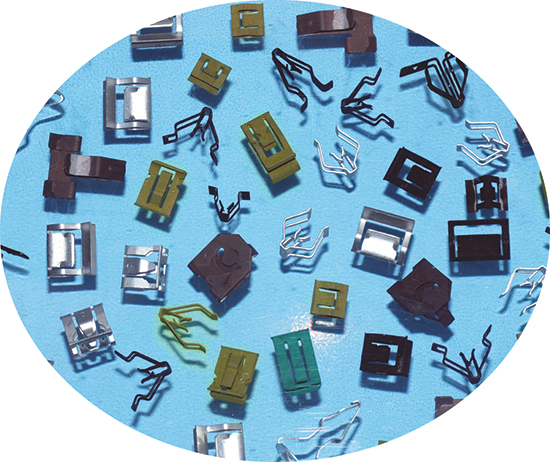 This includes time to tool up a die, as well as sharpen punches and perform other maintenance tasks. To quicken the pace, 2 years ago McCullah and Stith instituted a pre-changeover team. Also helping to minimize changeover times is standardizing on sensor setups at the press. While developing a sensor strategy on its existing dies the first time around can take 2-3 hr., once a die-protection strategy has been developed, the technician documents the approach. This speeds the die-protection portion of the overall setup job the next time the die enters production. Of course, more work orders for smaller batch sizes adds stress to the shipping and receiving department, particularly since every box of stamped fasteners goes out for heattreating and plating. “We have a lot of work-in-process inventory,” notes Stith. “As productivity has skyrocketed and we’ve been able to remove seven presses from the production process, we’ve leveraged the gained floor space to improve our shipping and receiving operation. We can pack parts more efficiently, the work flow is more organized and logical, and it’s much safer.